In theory, feeding kids a healthy diet should be easy. In theory, all it takes is three wholesome meals and two equally wholesome snacks a day. But then there’s reality…and between theory and reality is a gap. In that gap live the things that often get in the way of making sure your kids are eating healthy. In mine, there’s some pretty standard stuff: a family of five, one vegetarian, two jobs, and a crazy-busy schedule. Some days our gap is narrow, and some days it’s a canyon with only a pizza bridge to the other side. So recently, when I had the opportunity to ask the director of Nutrition Unlimited, Janelle Eligon-Ketchum RD, LDN, CDE, questions about healthy foods and nutrition tips for kids, I jumped at the chance. Q. Do you have any easy, healthy snack ideas for children that I can have on-hand (and that won’t ruin dinner or my attempts at maintaining a healthy diet for my kids)? Keep portion size in mind during your child’s snack times. Snacks should be portioned small enough that they don’t replace your child’s meals. Q. Do the same adult nutrition rules apply to kids? Most kids are smaller than adults; therefore they need smaller portion sizes. If the same nutrition rules applied, you would be trying to feed a 6-year-old portion sizes meant for an adult. That would be a lot more calories than they need. Focus on the recommended food groups and offer them to your child on a daily basis. Just like adults, children should be consuming recommended portion sizes from all the food groups on a regular basis. As kids get older, recommended calories, vitamins, and minerals change. Some nutrients stay the same, but others increase to compensate for the added weight and size of the body. Another good source to check for nutrient requirements for children is the U.S. Dietary Guidelines for Americans. Q. My 7-year-old is always “starving” (even after dinner and dessert). Is this something to be expected for her age, or should I be doing something different? If your 7-year-old is at a healthy weight, go ahead and offer additional portions at dinner. Healthy meals for kids should contain fruits and/or vegetables, protein, and some form of starchy carbohydrate. If offering additional servings at dinner doesn’t work, try offering more protein. Protein helps keep the body feeling satisfied. You could also offer a small healthy snack before bedtime to help eliminate food cravings until the morning. If weight-gain starts to become an issue, then you should speak with a dietitian so they can better assess your child’s diet and nutrition needs, as well as suggest kid-friendly recipes and develop a customized meal plan. Q. Are there calorie counts for children? I’ve never seen any, but if there are, should parents really be counting their kids’ calories? How can parents figure out how much is enough? Yes, there are calorie counts for children. In the 2015 Dietary Guidelines for Americans, they provide a table for daily caloric needs based on age, activity factor, and gender. Depending on the age of the child, parents shouldn’t need to count calories for children. Our bodies are very good at telling us when we’re hungry, and that signal is strongest in growing children. Most of the time, a child’s appetite will tell them when and how much to eat during mealtimes. Focus on offering age-appropriate serving sizes from all the food groups on a daily basis. If you are worried that your child is underweight or overweight or worried that they may be at risk, speak with a dietitian to see what changes could be made to ensure your child is getting all the nutrition they need. Q. Any tips for dealing with picky eaters? At some point, all of my kids stopped eating something temporarily, be it meat, cheese, dairy, or vegetables. What’s the best approach for handling this? Give them a multivitamin and wait it out, or try sneaking the food into their diet? Most children become pickier eaters at some point in their lives. The important thing to remember as a parent is that you choose the types of foods they eat and when they are served. The child ultimately decides what they eat and how much they will eat. Prepare healthy family meals and offer your child a variety of options at each meal, and encourage them to try everything. Don’t become a short-order chef and allow your kids to decide what type of food you prepare at meal times. If you cater to their likes and dislikes too much, then you run the risk of having them request only their favorite meals or missing out on the recommended food groups altogether. If you feel your children are not getting the appropriate nutrients, vitamin supplementation may be an option. Always check with a medical provider before adding any vitamin supplements. Speak with a registered dietitian to see what would work best for your child’s nutrition needs and the needs of your family. Everyone has different needs when it comes to diet and nutrition. 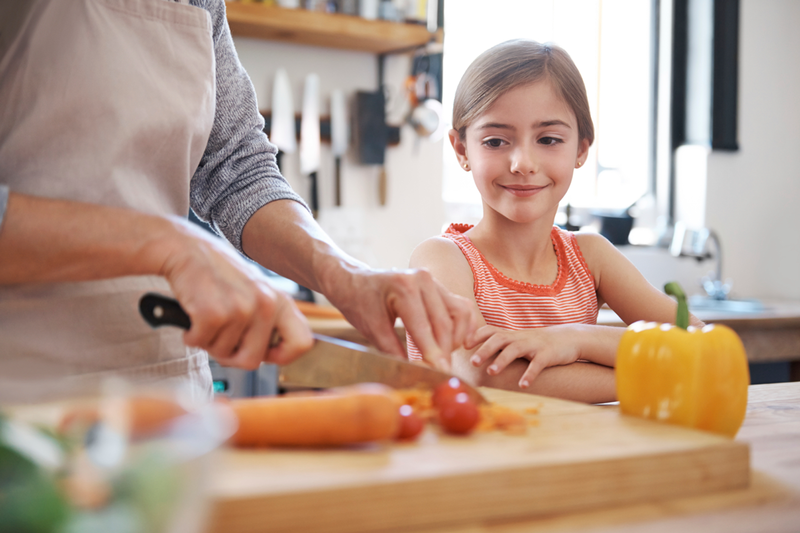 A registered dietitian can assess your child’s diet and nutrition needs, design a custom meal plan, help you overcome some of your child’s nutrition challenges, and give you tips and advice to make healthy eating a regular part of your life. If you’re an IBX member, your plan may include six free visits with a registered dietitian each benefit year. Check to see if your plan covers nutrition counseling. To find a participating registered dietitian, primary care provider, or another network provider who offers nutrition counseling, search our Provider Finder Tool or call 1-800-ASK-BLUE (1-800-275-2583) (TTY: 711).